This week I’ve got a strong hankering for some smooth time travel on the rocks. You see, I’ve decided to shake it up with a heady mix of old French fads and beauty secrets. So grab a seat, fasten your seat belt, and prepare for lift-off! Can’t sleep? Here’s an ancient French cure for the blues. Dissolve sea salt in one cup of hot water. In a separate bowl, add the camphor, ammonia and alcohol. Add seawater. Mix well and bottle. When needed, rub it on vigorously. And repeat. But don’t drink it! While living in Arles in 1889, Vincent van Gogh wrote his brother Theo: “I fight this insomnia by a very, very strong dose of camphor in my pillow and mattress, and if ever you can’t sleep, I recommend it to you.” Tip: Don’t try this concoction at home. Use Vicks Vapor-Rub instead. It’s safer—and still legal! Swing your DIY beauty bucket! 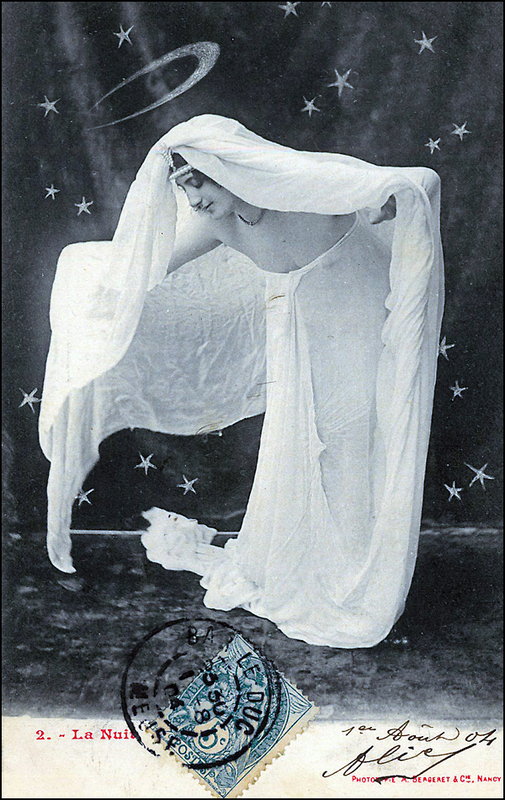 According to dancer Gabrielle Deslys, the best way to cleanse the skin while improving circulation was to travel to the seashore, collect salty beach sand, and then heat it, before scrubbing the skin until it glows. 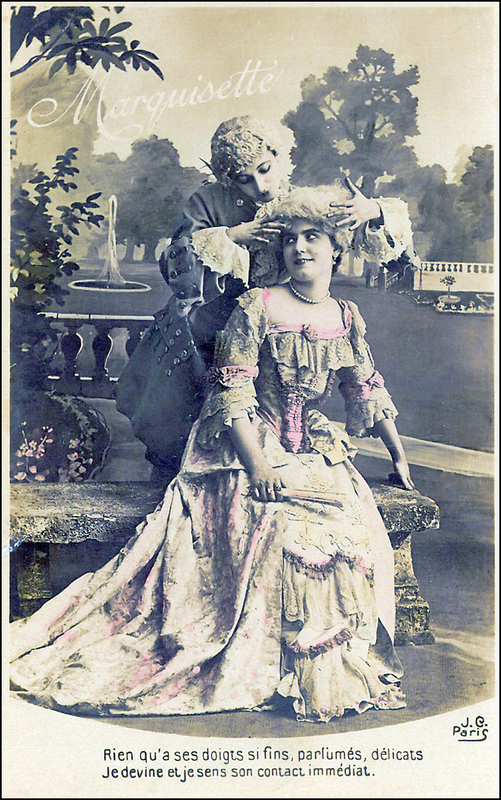 Back in the day, Mademoiselle Deslys was known for a dance called the “Gaby Glide,” and is credited with having performed the first strip tease on Broadway—while serving as a spy for the French government! Film buffs: Gaby’s swan-shaped bed had a cameo in Billy Wilder’s “Sunset Boulevard” flick. She was a star. Get out your Geiger counters! During the roaring “Années Folles,” radioactive produits de beauté were all the rage. 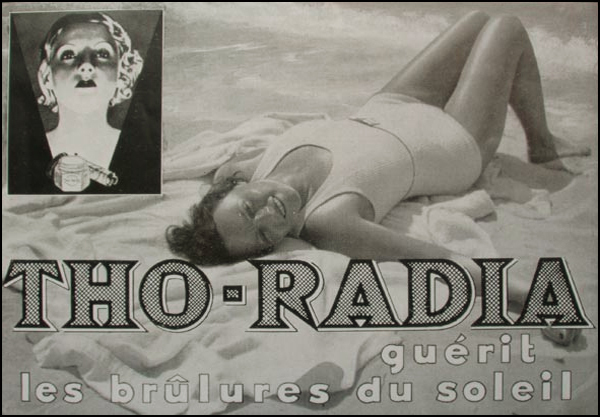 In 1932, Dr. Alfred Curie (amazingly, apparently no relation to Madame Curie) launched his own Tho-Radia line of beauty products, made with thorium chloride, and radium bromide. The pricey line included skin cream, cleansing milk, face powder, rouge, lipstick, and toothpaste. Promising lighter, brighter complexions, advertisements featuring a cool blonde washed in an eerie, bluish light who taunted, “Stay old if you want.” Ouch. Talk about sneer pressure! Catherine de Medici (wife of King Henri II) generously shared beauty secrets with daughter Marguerite de Valois and the court ladies, affectionately calling them “the flying squadron.” One such tip included taking a linen cloth and dipping it in milk, then adding slices of lemon, slices of orange, a dash of sugar and a dab of alum. Crushed snails were optional. The queen would apply this to her face, and then sleep with one eye open. You see, her highness was also known to send poisoned gloves as gifts to her enemies, so perhaps it’s best to take this recipe with a grain of salt. Just saying. During one of her post-WWII promotional beauty tours, Denise Miet said that perfume should be worn lavishly, but not so heavily that men rush to open a window. According to Mademoiselle Miet, fragrances should be worn at the hairline, inside the neckline of a dress, behind both knees, on the elbows, and at the hem of one’s petticoats as well at the temple, wrists, neck, and handkerchief. An unscented hankie is a “wasted opportunity” for more flower power. Coco Chanel had a different strategy when it came to the nozzle. “Where should one use perfume? Wherever one wants to be kissed.” Oh, la la. 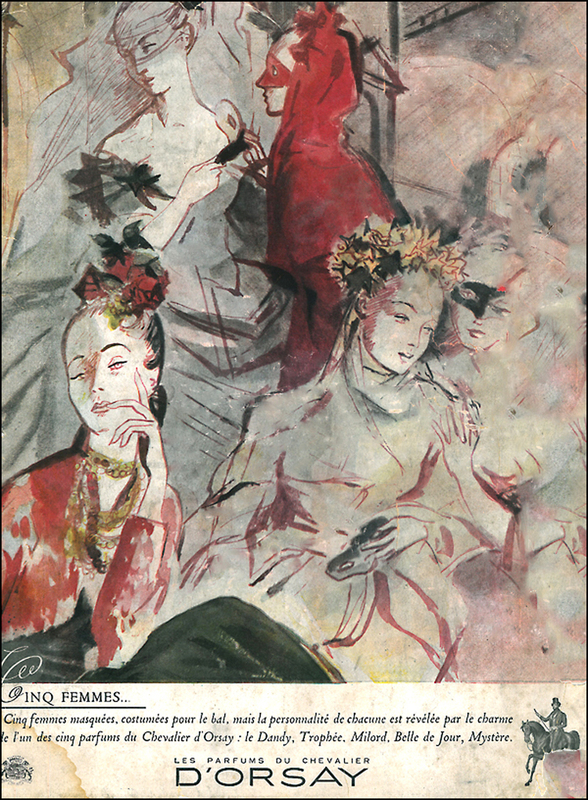 In 1913, trendy Parisiennes not only fell for Cubism, but they also imitated the works by Picasso and Braque, powdering their faces in mauve, terracotta, yellow, and blue before a night of hobnobbing at the Opéra or the dance halls in Montmartre. Were the ladies—as the New York Times asserted—imitating “hideous female types conjured up by the diseased minds of unconventional artists?” Or were they simply taking advantage of the harsh glare of the newfangled electrical chandeliers to generate a hauntingly strange concept of beauty? Here’s one for the road. Was it the automobile or the start of WWI that inspired the mud splash fad in 1914? Unlike the 18th century mooches velour in crescent, star, and heart shapes, the mud-colored beauty spots were applied randomly on the face. Not there to draw attention to facial features or to communicate desire or deviousness, the hipsters looked as if they’d been caught out in the elements without an umbrella or better yet—rolling around in a brand-spanking-new automobile. Or perhaps expressing confusion in a world of uncertainty and chaos was the message? Heck, every now and then, I could use a little jar of mud to call my own. Bonjour! Thanks for your super swell words! Here’s a funny Royal Tidbit for you: During the 17th century, Anne of Austria (Louis XIV ‘s mother) used to say, “One would sell one’s soul to the devil for perfume.” In 1630s she possessed one of the largest mirrors in France. It was only eighteen inches high and fifteen inches wide but it was a showstopper! Callers would come from miles away just to catch a glimpse themselves. Back in the day, mirrors were a hot gossip topic! Thank YOU for the swell words!! It was a fun post to create. And yes, I become totally obsessed with the topic. Sadly, I had to cut a few fads. Perhaps I’ll pen a part two. A wonderful excuse to purchase more postcards! Wink. Enjoy the weekend!! T.
Merci, Lizzie Joy!! I feel the same way about your photography/travel site. It’s a beauty. Your photography is spectacular. I loved today’s headline: “Pursue Only Those Things That Capture Your Heart.” Parfait! Enjoy the weekend, T.
Whew, what a crazy set of beauty tips! It makes me wonder what we’re using now that in 100 years looks as crazy as radioactive creams and perfume injections does to us. Thanks for sharing! I know! I know! What will make the future list? The mind squeals and reels. Any thoughts? T.
Merci. Merci. Research and the Fleas go hand and hand. Instant justification for shopping. T.
Well researched and interesting, as always. Great read! Thanks, Jessica!! As you know, I feel the same way about your work. Keep on trekking. Enjoy the weekend! T.
I know. I know! I’ve recently cut back! T.
Here’s another classic recipe! Goodness. Combine ingredients and stir into hot bathwater. A dram, by the way, is about a thimble-full. When I saw the title of this post I un-plugged my 1932 Marcel wave curler, peeled off the leaches under my eyes and took off my Crisco filled opera gloves so I could really get every yummy tidbit and tip out of your fabulous post. What a thrill… okay I am off to Blacks of Fifth Ave. and then my appointment at Sidney’s… despite the fact that I overheard the bitchy esthetician at Sidney’s say about me just last week. “Who does that old gasoline truck think he is fooling…he is sixty if he is a day!” …. Well like Mom used to say as she plucked her eyebrows. “Lanier honey, Beauty knows no pain.” In other words Theadora…I loved your post! Oh, I love you and your mother. Yes, beauty knows no pain. I’ll have to start using that line. I also love Marcel. In fact, I have a mad penchant for collecting the little wands. At the last minute, I cut a short nod to his fabulous wave. You are amazing! Thanks for the info on Marcel de France. Beauty knows no pain. Hi lovely T – we are about to embark on our Paris trip and, thanks to your fab’ post, I reckon I am going to return looking more youthful than when I departed…! Ah, thanks!! I’m working now on a story (a nod!) about the French pharmacy. Is there a beauty glitch or hiccup that can’t be fixed at the French pharmacy? I don’t think so! Enjoy the weekend! T.
Look forward to it. I am just going through photos of our visit to Paris in 2007 – oh how I long to go back! New Zealand is so far away, but hopefully we return in Spring 2014 – I have much unfinished business! I like the idea of the women powdering their faces with mauve, terracotta, yellow and blue. Thanks for such an interesting post! Merci!! Yes, I’m with you. I’d also like to try the look. Perhaps Gotye and Kimbra (Someone That I used to know) beat us to the punch?! T.
Glorious images – you must have such fun searching these things out. Ah, thanks. I do enjoy the entire process. Especially the shopping for the postcards at the Fleas!! 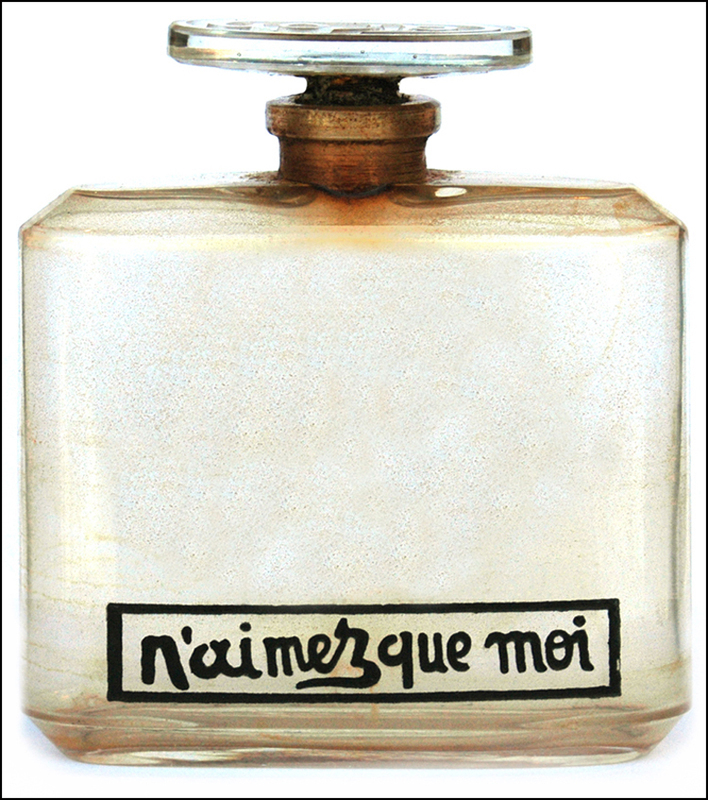 T.
Already in 1916, they had fancyful names on the Parfumes! (1933), Rumeur (1934), and Prétexte (1937). Sassy, eh? Oh, la la. Fab! Love your never-ending archives, Mlle B., and your marvelous sense of the wry! Bon weekend! Dear P., Merci!! Thinking of your magnificent floral shots and Chicago parks, here’s another tidbit. It takes eleven tons of roses—some 60,000 roses—to make just one ounce of essence of rose. Amazing. The damask rose and the cabbage rose are favorites. Enjoy the weekend!! T.
That’s some tidbit, Mlle B.! But the aroma of just one damask rose is never forgotten…this I know! What a wonderful post! Although those concoctions sound crazy to us I wonder what they would think of the products we use today. Lovely read and thanks again! Got anything to make me young and handsome? “Pretty is as pretty does,” as my grandmother used to quip. I try to follow her beauty tip, well, on most days! Wink. T.
Fantastic post! So fun and fascinating! Thanks, Karen!! I’d like to give the mud splash beauty spot treatment a shot. Or at least track down the old packaging. I’ll keep you posted! T.
[insert horrified emoticon]! Stripping spies, nuclear make-up, perfume injections. I need a lie down. Wonderful and entertaining as always, T. Wow injecting perfumes….glad we got a little better with that. Now the sand scrub thing, I guess we’re still ascribing to that tradition. Loved it! Thank you!! Thanks, B.!! Yes, I think I’ll play it safe and give Gaby’s “baked sand” recipe a shot! T.
Wow–I learn something new every time. Tho-Radia! It is distracting enough to see the glow of cell phones when people are texting during a movie or theater performance, but just imagine if the people themselves were glowing! Weird! Thanks, Martino!! A few years ago, I bought a Tho-Radia powder box and lipstick at a vide-grenier (yard sale) in Paris for a few euros a pop. I guess they wanted to get rid of them! Perhaps I’ll take a photograph and add them to the post. Enjoy the week! T.
Beautiful, amazingly researched post. Your detail of people, places and things is astounding! Keep up the good work! Dear Anita! As always, thank you for your super kind words. What a great way to start the week. Merci!! T.
What fun Theadora! The comments and conversations too. Very entertaining post. Well, thank you!! The comments and conversations here are always lively, interesting and witty, too. I feel very, very lucky!! T.
It’s like ‘life’ – what you give out bounces back (x10). just saw some dolphins(really)! Thanks Theadora! No, I didn’t post photos. Perhaps I should. Better keep the camera ready. they are elusive! Still laughing about the insomnia treatment! 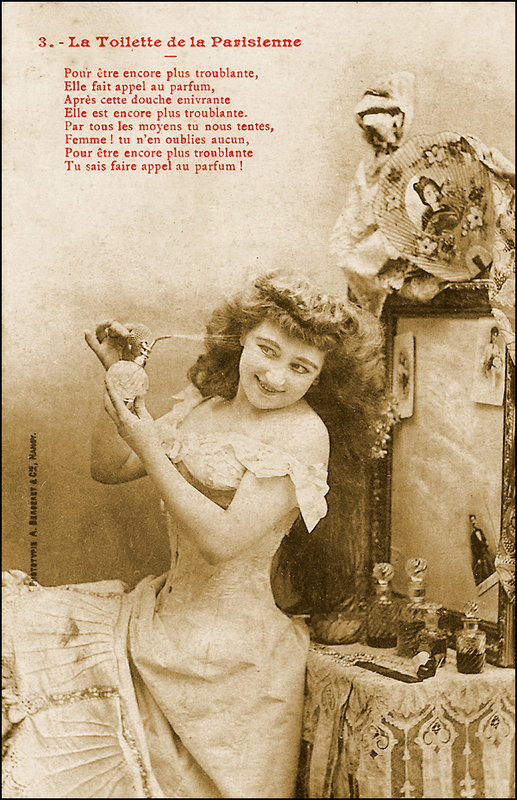 I honestly think you have the material for a terribly interesting book on your hands: a detailed history of French beauty cures. By the by, injecting fragrance sounds like something a certain overexposed reality family in North America would promote. Thanks, Krista!! Here’s another favorite beauty tip from Provence. 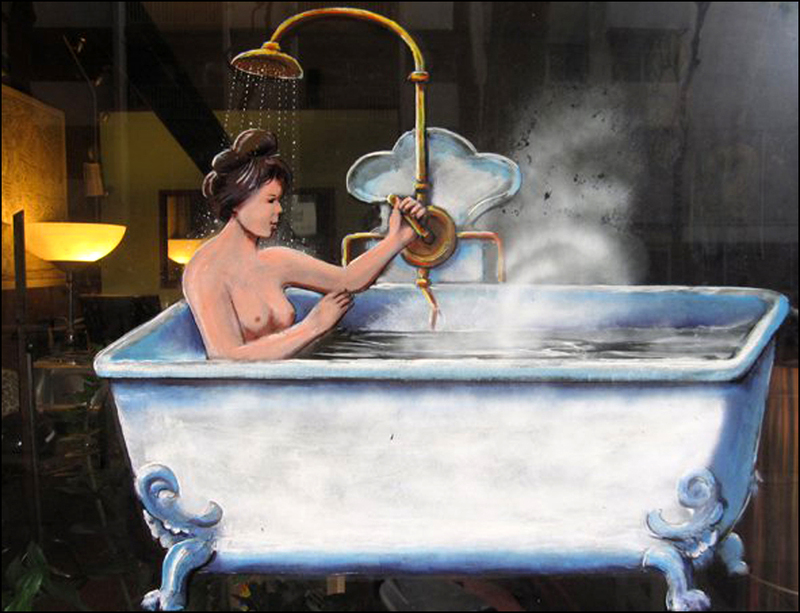 I recently met a woman who soaks her legs in rosé wine once a week. Supposedly it cuts down on varicose veins. “Cleopatra got it all wrong,” she told me. She buys her Cote de Ventoux by the box! I’ll try it and report back with my findings! I love everything about that. Please report back with your findings! I wonder what future humans will think of our irradiated meat, formaldehyde hair treatments, lead in lipsticks (still!) and chemical facial peels. But, that Van Gogh treatment I might have to try. Legally of course. OH. Yes. Back in the day, I tried to “erase” my freckles with lemon juice, but they didn’t go anywhere. Stuck like glue, they’re still with me, thank goodness. I now embrace them (on most days!) Enjoy the Van Gogh treatment! T.
Love that vitrine photo. Sleeping with one eye open… sounds like a cat. This may be my favorite post of yours! Very informative and fascinating tidbits of information, all mixed in with your imitable style and photos..Keep ’em coming! Theadora, I love this post! Speaking of Gaby Deslys…I was wondering where you found the info here (on sand!)? I just bought a booklet (that originally came with her make-up line, at the time), and she only talks about the make-up. I was wondering if you found this in an old magazine? I am working on an article, and book eventually, about her, and am interested in this more obscure information. I have a biography about her, which is really great, but doesn’t get into some of these more interesting things. Thank you, Thom! It’s time to make another postcard run. Heck, it’s always time to make another postcard run. Enjoy the week! T.
I loved this post! I love reading about beauty fads! It’s amazing the crazy things women have done all in the name of beauty, like injecting themselves with fragrance?! Wow. Talk about crazy! I love this! So interesting! Thanks for sharing. What a clever post! I can’t help but chuckle reading most French women’s magazines. My favorite was a recent ‘chewing diet’. But these thoroughly trump them all. I should be toddling off to the supermarket for dreary laundry detergent etc but I am having way too much fun here!!! Hello! Just got back from Austria. So tired ~ really need a good bath! Oh mais madamoiselle!..Vous utilisez les mots et les paroles commes si vous lancez des petales de roses! J’adore! But of all your clever, and may I say, madame, also cheeky puns & fun..its your little ”oh lala’s” (of which I treasure the one replied in comment to me personally) that float so..so coquettishly! I know, I know, overusing that word will remove its smile, but it is so much part of your writing…un GRAND merci!! love these beauty secrets, thank you!!! Nice post … Interesting illustrations. One day I hope to make it to France. My step-daughter spent six weeks in France with a group she studied with. 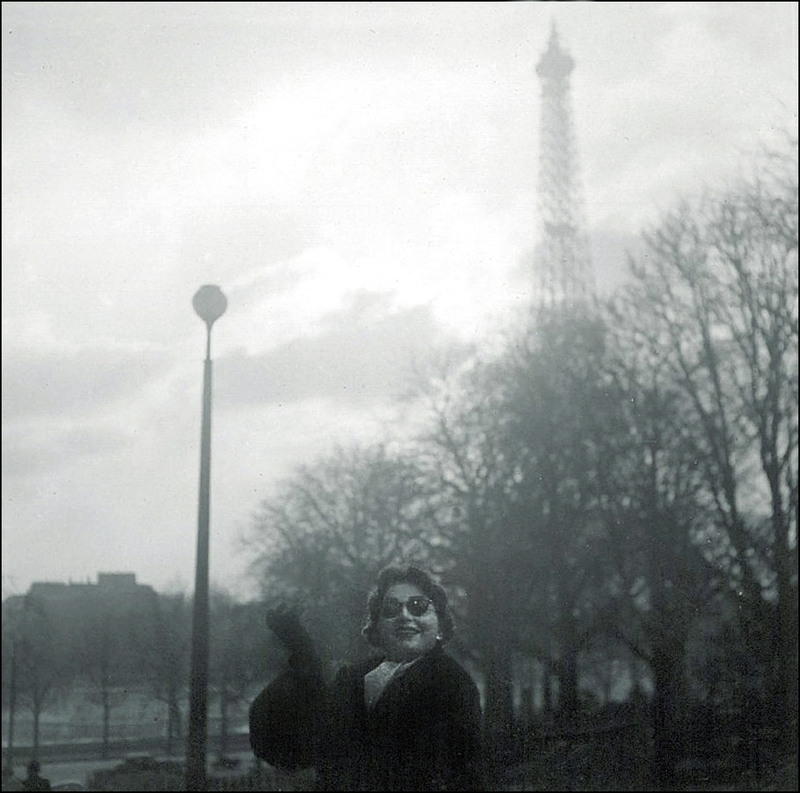 Her minor was in French and they spent three weeks in Paris and three weeks in the country. Keep up the excellent work. Thoroughly enjoyed reading this post!